Not long ago, summer theater productions were few and far between, prompting many a Backstage columnist, including myself, to create profile features on local performers throughout the entire month of June. Last summer, eight productions opened between June and August, and this year nine are scheduled, providing a wide variety of engaging and enjoyable entertainment for all ages commencing next weekend. ProArts Playhouse in Kihei concludes its season with “Same Time, Next Year,” by Bernard Slade, directed by Lee Garrow. In this two-person romantic comedy, George, (Neil Sullivan) an accountant, and Doris (Patty Lee), a housewife, meet at a Northern California seaside inn, have an affair and agree to meet once a year. Over the course of the next 24 years, they develop a deep emotional intimacy, discussing births, deaths and marital problems while adapting to the social changes affecting their lives. * Performances are at 7:30 p.m. Thursdays through Saturdays, 3 p.m. Sundays, opening Friday, June 22 and running through July 8 at the ProArts Playhouse at Azeka Place Makai in Kihei. Tickets are $26. For more information or to purchase tickets, call 463-6550 or visit www.proartsmaui.com. Next month, Adaptations Dance Theater will present its third annual “Bring it Home” dance concert which “brings home” dancers and choreographers with close ties to Hawaii to present and perform original dance. “Bring it Home 2018” will feature works by guest choreographers Nathaniel Hunt, Ali McKeon and ADT’s Co-Artistic Director Hallie Hunt. Returning guest performer Katie Istvan joins Maui dancers Amelia Couture, Cady Cox, Jen Cox, Nicole Humphrey, Ashley Krost, Emily McKeon, Nicole Yezzi and ADT apprentice Jessica Bartlett. * Performances are at 7 p.m. Friday, July 6 and Saturday, July 7 at the ‘A’ali’ikuhonua Creative Arts Center on the Seabury Hall campus in Makawao. An opening-night gala will be held at 5:30 p.m. Tickets include beverages, pupu and live music. Friday’s performance is a 21-and-over event. All ages are welcome on Saturday. Attendees may bring their own beer and wine and will also have the opportunity to mingle with the artists at the after party. Tickets to the Friday opening-night gala are $55. Saturday tickets are $29 for adults, $15 for students. To purchase tickets or for more information, visit www.adaptationsdancetheater.com. 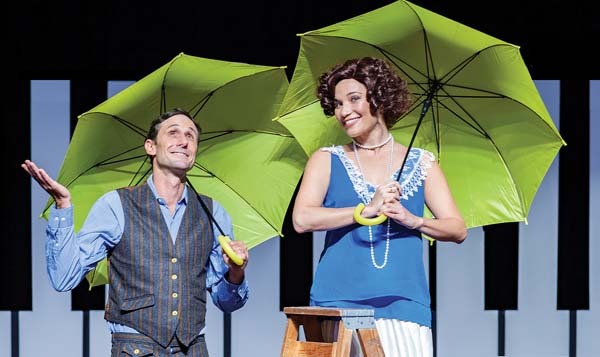 Also in July, Maui OnStage presents the Maui premiere of “Singin’ in the Rain,” music by Nacio Herb Brown, lyrics by Arthur Freed, book by Betty Comden and Adolph Green, directed by Alexis Dascoulias, choreographed by Erin Kowalick and under the musical direction of Steven Dascoulias. Adapted from the MGM movie musical and set in Hollywood at the advent of talking pictures, “Singin’ in the Rain” features all the familiar songs from the film including “Fit As A Fiddle,” “All I Do Is Dream of You,” “You Are My Lucky Star,” “Good Morning” and the title track. Local musical theater stars Chris Kepler, John Galvin and Lia De Souza play the familiar leading trio. * Performances are at 7:30 p.m. Fridays and Saturdays, 3 p.m. Sundays, July 13 through Aug. 5 at the Historic Iao Theater in Wailuku. Tickets range from $20 to $40. To purchase tickets, call 242-6969 or order online at www.mauionstage.com. Parents with young children will have many keiki theater options this summer including “Paw Patrol Live!” at the Maui Arts & Cultural Center in Kahului in July. It’s the day of the Great Adventure Bay Race between Adventure Bay’s Mayor Goodway and Foggy Bottom’s Mayor Humdinger, but Mayor Goodway is nowhere to be found. Paw Patrol character Ryder summons Marshall, Chase, Skye, Rubble, Rocky, Zuma and Everest to rescue Mayor Goodway and to run the race in her place. * Performances are at 6 p.m. Friday, July 13; 10 a.m., 2 p.m. and 6 p.m. Saturday, July 14; 10 a.m. and 2 p.m. Sunday, July 15 in Castle Theater at the MACC. Tickets range from $20 to $125 (plus applicable fees). Children age 1 and older must have tickets for this production. The $125 Paw Patrol VIP tickets include first-four-rows seating and admission to the Paw Patrol post-show party which includes a meet and greet with two costumed characters, a gift bag, photo opportunities and children’s activities. For more information or to purchase tickets, visit the box office, call 242-7469 or visit www.mauiarts.org. Three local youth theater productions will also be running in July. First up is Theatre Theatre Maui’s production of “Oliver!,” music and lyrics by Lionel Bart and based on the classic novel by Charles Dickens, directed by Kristi Scott, choreographed by Felicia Chernicki-Wulf and under the musical direction of Aida Moala. * Performances are at 7 p.m. Thursdays through Saturdays, 2 p.m. Sundays, July 19 through 29 at the Lahaina Gateway Center (mauka-side, unit B114). Tickets are $12 for ages 13 and older, $7 for ages 3 to 12, and will be available in advance at Lahaina Music starting on July 1. Admission is free for children age 2 and younger. For more information, contact Theatre Theatre Maui at 661-1168 or visit www.ttmwestmaui.org. Maui OnStage Youth Theater invites you to be their guest at “Disney’s Beauty and the Beast Jr.,” music by Alan Menken, lyrics by Howard Ashman and Tim Rice, book by Linda Woolverton, directed and choreographed by Dejah Padon. * Performances are at 11 a.m. Saturdays, 1 p.m. Sundays, July 21 through 29 at the Historic Iao Theater in Wailuku. Tickets are $10 for adults, $6 for children. To purchase tickets for any Iao Theater event, call 242-6969 or order online at www.mauionstage.com. The Maui Academy of Performing Arts presents “Disney’s The Lion King Jr.,” music by Elton John, lyrics by Tim Rice, book by Roger Allers and Irene Mecchi, co-directed by Logan Heller and Sally Sefton, choreography and costumes by Kathleen Schultz, under the musical direction of Danielle Mealani Delaunay. The African savannah comes to life on stage in this Maui premiere with Simba, Rafiki and an unforgettable cast of characters as they journey from Pride Rock to the jungle and back again. * Performances are at 7 p.m. Thursday through Saturday, 3 p.m. Saturday and Sunday, July 26 through July 29 in the ‘A’ali’ikuhonua Creative Arts Center on the Seabury Hall campus in Makawao. Reserved seating tickets are $15 for adults, $12 for children; general admission tickets are $12 for adults, $10 for children. For tickets or more information, visit www.mauiacademy.org. Vinnie Linares’ Oh Boy Productions will present the Hawaii premiere of “Albatross” by Matthew Spangler and Benjamin Evett, based on “The Rime of the Ancient Mariner” by Samuel Taylor Coleridge, directed by Jennifer Rose and starring Frank Kane. This award-winning one-actor production is not “officially” confirmed to open in early August, but you can anticipate an announcement of tickets available for purchase through the MACC next month. Lastly, the 2018-19 theater season begins on the last weekend of August with MAPA Live’s “Into the Woods,” music and lyrics by Stephen Sondheim, book by James Lapine, directed by David C. Johnston, choreographed by Andre Morissette and under the musical direction of Gary W. Leavitt. The famous children’s fables are tied together by a childless baker and his wife and their quest to begin a family, and a witch who has placed a curse on them. The lavish production will star such local favorites as Kathy Collins, Jerry Eiting, Casey Hughes, Sara Jelley, Ricky Jones, Lina Krueger, Leighanna Locke, Kirsten Otterson, Francis Tau’a and many more. * Performances are 7:30 p.m. Fridays and Saturdays, 3 p.m. Sundays Aug. 24 through Sept. 2 in Castle Theater at the MACC. Tickets range from $25 to $75 (plus applicable fees), and are available in July through the MACC at the box office, by calling 242-7469 or online at www.mauiarts.org.